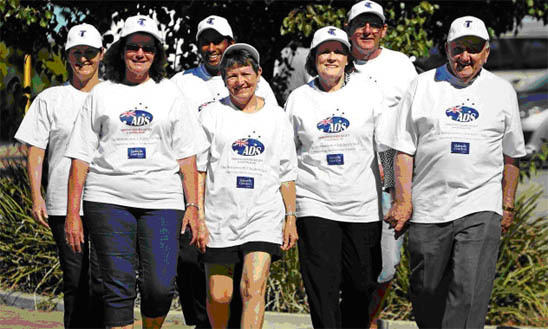 Bev Bertocchi, Derryn Carnaby, Siri Siriwardene, Allyson Noble, Rose Marie Vojakovic, Kevin Noble and Robert Vojakovic are among those taking part in the fundraising walk. Picture: Michael Wilson/The West Australian. The ADSA's Rose Marie Vojakovic said that tonight the group would be bedding down in a sports complex. An early start will be needed tomorrow (May 3) as the day will begin with a visit to a local school to talk to the children about the purpose of the Walk for Wittenoom Children. Afterwards, the walkers, whose ages range from 17 to 88, will be waved off on their journey through the goldfields and wheatbelt by members of the local community. They are hoping to raise as much as $100,000 for research into asbestos-related diseases. The May 3rd 120 km leg of the journey will take them to Northam, where they will be welcomed by the Mayor. 1 See articles: Poloni GD. A Long Trek to Perth to Tackle Mesothelioma. May 1, 2012. Peacock M. Fundraising walk to highlight asbestos cancers in young Australians. April 30, 2012.